Renowned for its eclectic mix of international stars and local talent, this year’s Sherborne Abbey Festival broadens the programme with a first visit by the exuberant Jiving Lindy Hoppers and Harry Strutters’ Hot Rhythm Orchestra, with an irresistible invitation to join them for an evening “Swinging at the Cotton Club” at the Big School Room of Sherborne School on Sunday 4th May. The Cotton Club was the famous New York nightclub that attracted the rich and famous to the black ghetto of Harlem in the 1920s and 30s. At a time when black musicians had to enter hotels or concert halls by the back door, the Cotton Club was a mecca for white and black music-lovers alike to hear America’s greatest jazz musicians, composers, band-leaders, singers and dancers. The list of performers at the club includes Duke Ellington, Louis Armstrong, Cab Calloway, Billie Holiday, Ella Fitzgerald, Fats Waller, Bojangles and the dancing Nicholas Brothers. The Jiving Lindy Hoppers, arguably the world’s leading jazz dancers, and Harry Strutters’ Hot Rhythm Orchestra celebrate this fabulous, legendary nightclub and its enduring legacy. They are accompanied by vocalist Marlene Hill and compere and singer Megs Etherington. 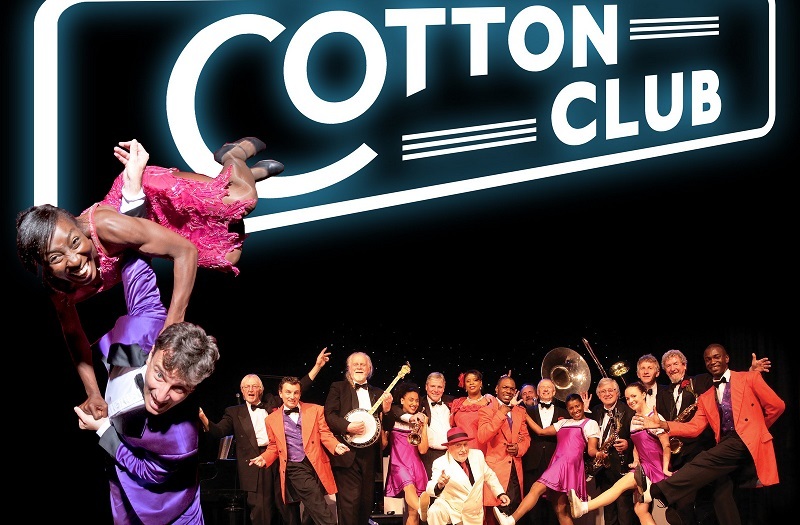 Swinging at the Cotton Club begins at 7.45pm.